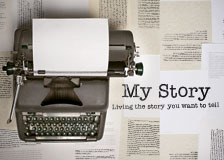 Craig Groeshel's latest series is called, My Story. It is fantastic. His premise is this, one day we're all going to tell a story about our lives. The decisions we make today will determine the story we'll tell tomorrow. In the series, My Story, we learn to live a story worth telling. Here are a few questions that got me thinking & I want to share with you. 1) Do you feel you're living a story worth telling? Why or why not? 2) What do you think you calling is for your life? 3) What's one thing you need to start doing today? A discipline or habit. What’s your next step? It is amazing to think how the next year or chapter of your story will read. And that what we do today will affect/determine tomorrow. I love the idea that we are on page 16 of book 2013. What have you started this year? Working out, forgiving someone, spending more time on something or someone, loving more. Whatever your "resolutions" may be this year see if you can apply Craig's idea & start just one thing that will change story. Nothing is by accident, it starts with a decision.